New York Times copy editor suffers exclamation-point-induced heart attack. 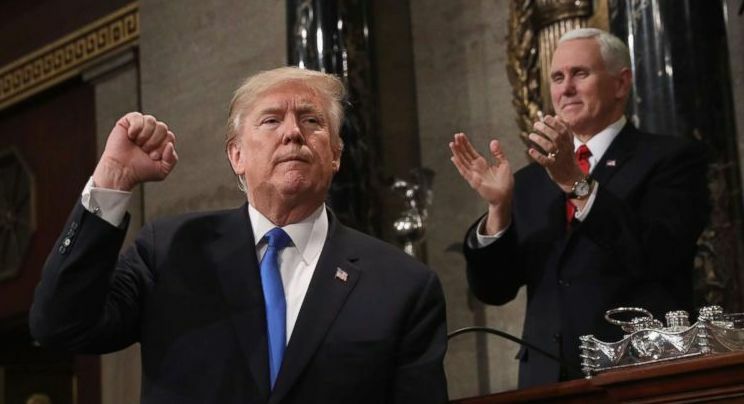 President Donald J. Trump gave the shortest State of the Union address in the history of the United States last night to a joint session of Congress and nearly a dozen Americans watching on live television. “It’s a pleasure for you to be here with me tonight! “Introducing Nick Sandmann! Here tonight! Great American hero! Unfairly treated! Most unfairly of anyone! Anywhere! Ever! Great kid! Future of this country! “Border wall! Crisis! National emergency! Drums are for suckers! Red hats for every man, woman and child! Especially men! Democrats block things! China’s got nothing! We win trade wars! Best things ever by a president! Greatest things! And more things than any president before! Like magic! “Nancy Pelosi bad! Mueller worse! Hoax! Cowards! Traitors! No government planes! No collusion! Liberal elites! Failing press! Fake news! I’m intelligent! Very smart! Schumer! Nancy! “Immigrant caravans! Criminals! Rapists! Drug dealers! Republican Senate! “Burn, baby burn! Dig, baby dig! COAL! Democrats, taken off guard, struggled to find someone within their rank-and-file who would be able to say so little with even fewer words. Bernie Sanders declined to step in, saying he had tried that once before but was cheated by establishment Democrats. Ultimately, the honor went to a representative from Rhode Island’s 1st District. Prior to the address, an assistant White House press secretary, whose name no one knows, announced Trump would likely extend his comments “from the gut” once he had an audience. However, for the very first time in his presidency, Trump stuck to his prepared remarks. Rank-and-file Americans, meanwhile, voted a real magician off of America’s Got Talent. In a related development, a Trump administration official, speaking on the condition of anonymity, said Press Secretary Sarah Huckabee Sanders could not be found in the hours leading up to or during the address. The official said Sanders was finally found in the bowling alley below the White House muttering “God wants it this way” over and over to no one in particular. Also related, a New York Times copy editor suffered a mild heart attack while reading Trump’s prepared remarks, which were literally littered with exclamation points. She is recovering at Mount Sinai Hospital, where she’ll be kept for at least another day for observation. According to the history of the U.S. House of Representatives, U.S. presidents have now given 96 in-person State of the Union addresses, which have been known by various names, since the first in 1790. If you liked this satirical post, please follow IV Words!